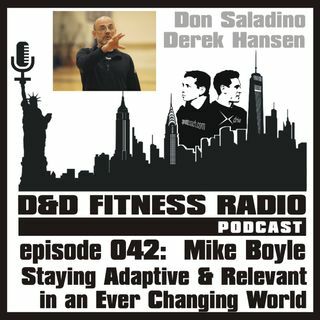 In Episode 042 of the D&D Fitness Radio podcast, we spend time with veteran Strength and Conditioning Coach, Mike Boyle, after first discussing the challenges and pressures of being anointed as a fitness and exercise expert on social media. Coach Boyle provides his perspective on how quickly things have changed but, more importantly, how we have to adapt to change in an exceptionally dynamic world. We discuss the changes in fitness and performance industries, but also the important ... See More differences in how we communicate and connect with the younger generation in these various fields. Marketing and advertising in business has changed dramatically, and those who are interested in developing their brand and marketing their services must stay ahead of the curve. Knowing your audience is critically important and having a strategy around developing a relationship with a younger audience must be part of your approach. Michael Boyle is one of the foremost experts in the fields of Strength and Conditioning, Functional Training and general fitness. He currently spends his time lecturing, teaching, training and writing. In 1996 Michael co founded Mike Boyle Strength and Conditioning, one of the first for-profit strength and conditioning companies in the world. Mike Boyle Strength and Conditioning exists for one reason: to provide performance enhancement training for athletes of all levels. Athletes trained range from junior high school students to All Stars in almost every major professional sport. Prior to Co- founding Mike Boyle Strength and Conditioning, Michael served as the Head Strength and Conditioning Coach at Boston University for 15 years, also for the past 25 years he been the Strength and Conditioning Coach for Men's Ice Hockey at Boston University. Mike also was the Boston Red Sox strength and conditioning coach in 2013 that won the World Series. In addition to his duties at Boston University and the Red Sox, from 1991-1999 Boyle served as the Strength and Conditioning Coach for the Boston Bruins of the National Hockey League. Michael was also the Strength and Conditioning Coach for the 1998 US Women's Olympic Ice Hockey Team, Gold Medalists in Nagano and 2014 Silver medalists in Sochi, and served as a consultant in the development of the USA Hockey National Team Development Program in Ann Arbor, Michigan.